Buffalo wings are not native to England. I’ve never had a proper buffalo wing in this country which is strange because there’s a chicken shop on every corner. When an English person asks for a hot wing, they’re expecting fried chicken wings with cayenne mixed in the flour. No sauce on them, no blue cheese, no carrots, no finger licking. This has posed quite a challenge for me because Buffalo wings are my favorite food. OK so it’s my second favorite food. My most favorite food since I was five years old is Salisbury steak TV dinners…the ones with the mashed potatoes and corn (and remember back in the day when there was the cherry crumble for dessert) but I’m definitely not getting that in England. Well, no more. Houston, we’ve got WINGS! Mike and I discovered Sticky Wings on a whim while walking along Brick Lane. Now for those of you who have never been to London, Brick Lane is the heart of Indian cuisine in the City. The narrow, partially cobbled street is line with Indian restaurants with curry wafting through every door. As you walk down the street each restaurant host tells you how lovely you are and offers you a deal on the best curry in London. As we walked past each restaurant wondering which “award winning” establishment we would grace, I saw something different. A sign not touting Bombay’s best but Sticky Wings. My heart stopped. Could it be? Were my eyes deceiving me (because you know I’m getting older and everything else is breaking down)? Was this a wing shack? I looked at the menu posted on the glass and to my utter glee, discovered that Sticky Wings is a US style wing joint. When we go in we’re greeted by Darul, the English owner who spent several years working and eating in the US. We could see by the Frank’s Red Hot and French’s mustard on the tables that he’d really paid attention. He even imported old Chili’s tables to make the restaurant even more American. His one-page menu has only a few flavors of wings but that’s the key. A short menu means more time to focus on getting those few dishes right. On our first visit, we tried the buffalo and the sticky BBQ with fries and a side of deep fried corn on the cob (no that’s not a typo it was deep fried). We chose the American portion (11 wings) to share between the two of us. The UK portion is a more manageable 6 wings (yes, now that we live in England I can’t handle an American sized portion of anything anymore). The wings are cooked perfectly and you can tell that the meat is high quality (definitely no arsenic in these chickens). I’ve eaten Buffalo wings in their birthplace, the Anchor Bar in Buffalo, NY, and these weren’t far off. The trick to a good naked wing is to fry them (without breading) so that the skin crisps up. Then you coat them with the sauce just before serving while they’re piping hot so that the skin stays crispy. Not a lot of people can get the crispy part just right but Darul did it. 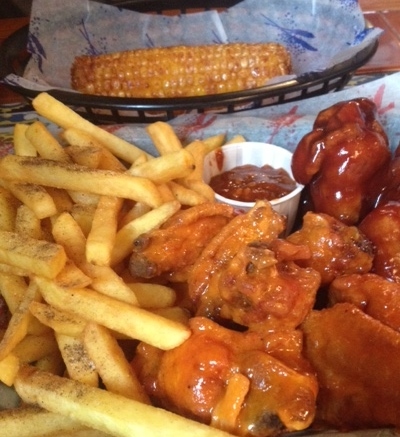 No soggy wings here. The sauces were excellent. My only complaint was that the sticky BBQ wasn’t sticky enough. On our second trip later that evening (yes we had a fat day that day and went back a few hours later), we tried the jerk twist which was, quite honestly, one of the best wing sauces I’ve eaten. I don’t want to give away the twist but it was definitely a pleasant surprise. We also had the fried mushrooms on our second trip. I literally couldn’t stop eating them. When we were down to the last one, we nearly fought. And back to that deep fried corn on the cob. Yes, everyone thinks that we Americans deep fry everything so why did I need to come to the UK to try deep fried corn? Pure GENIUS! The corn isn’t battered or breaded; it’s just dipped in the hot oil to cook. Darul adds some secret spice to give it some kick and voilà! As we left the second time, the owner gave us a parting gift. Two slices of homemade Oreo cheesecake. I don’t eat cheesecake but Mike’s direct quote as he stared dopey eyed at his empty, chocolate smeared fork “this guy is doin’ something”. I think he might love Sticky Wings’ Oreo cheesecake at least as much as fried chicken. So if you happen to come to London head over to Brick Lane and say hi to Darul at Sticky Wings and tell him the Americans sent you. It’s definitely worth the stop.